But according to researchers, a simple tweak by your doctor could make all the difference. 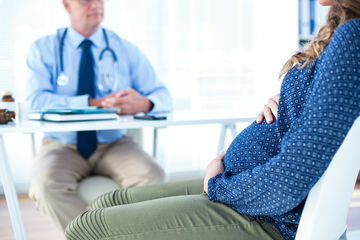 A procedure performed on about two million pregnant women every year has been linked to increased risk of premature birth and infant death, according to researchers. The good news? It can be made safer if surgeons make one simple tweak when performing it—and researchers from Imperial College London are urging doctors to make this change. The procedure in question is called the cervical stitch (also known as cerclage) and is just what it sounds like: a doctor puts a stitch in the cervix to keep it closed. Ironically, the purpose of this procedure is to reduce rates of preterm birth—a cervical stitch is generally performed on women who are at risk of delivering early or miscarrying. Here's where things get complicated: Surgeons use one of two types of thread during cervical stitches: A thicker (about 5mm) woven thread, which is reportedly used in about 80 percent of all cases; and a thinner thread, which is just 1mm thick and is only used about 20 percent of the time. According to the new study, if surgeons switch to the thinner thread, 170,000 premature births and 172,000 intrauterine deaths could be prevented globally every year. The study's lead author, Phillip Bennett, weighed in. "Although the cervical stitch procedure still holds benefits for women overall, our results suggest the thicker thread may encourage the growth of potentially dangerous bacteria in the cervix," Bennett said. "This may lead to premature birth or even loss of the baby. We strongly advise that the thicker thread—which is currently used in the majority of procedures—only be used in a research setting whilst we thoroughly investigate the risks this may hold." Surgeons believe the thicker thread is stronger, which is why it is used more often, but after researchers looked at data from 671 women who have had the procedure, they discovered that use of the thicker thread was linked to a 28 percent preterm birth rate (as compared to just a 17 percent rate with the thinner thread). Women who have not had this procedure have around a 7 percent rate of preterm delivery. In addition, the thicker thread led to a 15 percent rate of intrauterine death, as compared to a 5 percent rate with the thinner thread. The team gave this issue a deeper look: They monitored 50 women who underwent the procedure—half of them were stitched with the thicker thread, half with the thinner—and observed the subjects 4, 8 and 16 weeks later. Researchers noted that the women with the thicker thread had more inflammation and bacteria around the cervix. They also had greater blood flow to the area, which can cause the cervix to open up before labor. "At the beginning of the trial, all women had similar types of naturally-occurring bacteria, called Lactobacillus, in their birth canal and around their cervix," Dr. David MacIntyre, the study's scientific lead, said. "However, four weeks after the procedure, 45 percent of the women who received the thicker thread had these harmless bacteria replaced with potentially dangerous bacteria that have previously been associated with poor outcomes during pregnancy, like preterm birth and infection in babies. Women who received the thinner thread maintained normal levels of harmless Lactobacillus bacteria in the birth canal or cervix." Dr. MacIntyre explained this in greater detail: "Our current study suggests the thick multifilament thread is associated with increased risk of complications," he said. "Even after factoring in the age and overall health of the patient, this effect still existed. However there are other factors that may influence the risks, such as surgical technique. Only by performing a large randomized clinical trial can we confirm whether the thicker thread itself is triggering complications, to ensure this procedure is as safe and effective as possible for the mother and baby." Does that mean this procedure is to be avoided at all costs? No, it simply means that you should speak to your doctor about this piece of news and weigh your options carefully.